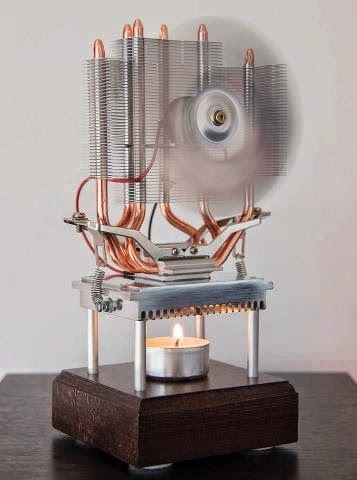 Candle light fan use technology which converts heat directly into electricity using a effect called Seebeck. The only problem with these fans is their efficiency which is lesser than 10 %. To use this technology we need thermoelectric materials such as Bismuth Telluride(Bi2Te3) or Lead Telluride (PbTe). Is their any difference ? Yes, it is very different technology and unlike Dynamo (First Electric Generator, it is most commonly used for bicycle headlight),their is no moving part involved in electricity generation with thermoelectric materials. What is the use of this project? It helps you to understand basic concept of thermoelectricity which is used in spacecraft as Radioisotope to convert the heat released by the decay of a suitable radioactive material into electricity and in automobiles where it helps to reuse waste heat from Internal Combustion Engine. You can find complete instructions about this fan here.